The HERO3+ Silver Edition takes everything you know and love about the HERO3 and adds some modest improvements. Like its big brother, the HERO3+ Black Edition, this camera reduces some of the bulk of GoPro's previous cameras while improving battery life. The HERO3+ is an incremental upgrade on the HERO3, providing a few new features in essentially the same package. For users who are looking to jump from an older camera and don't need professional-grade equipment, this is the GoPro for you. For consumer reviews and further product specs. One of the first things The Cam Critic noticed with the HERO3+ Silver Edition is its new protective casing. Compared to previous models the new housing is slimmer, more compact, and easier to work with. It reduces the size of the HERO3+ Silver by almost 30%, while being less difficult to put on and take off. GoPro's also added extra space to the enclosure for interior moisture patches (also known as anti-fog inserts) to prevent condensation buildup when the camera is submerged. The HERO3+'s new waterproof housing will protect the camera to a depth of 40m and introduces a quick clip design, which lets you easily attach the camera to a belt or strap. 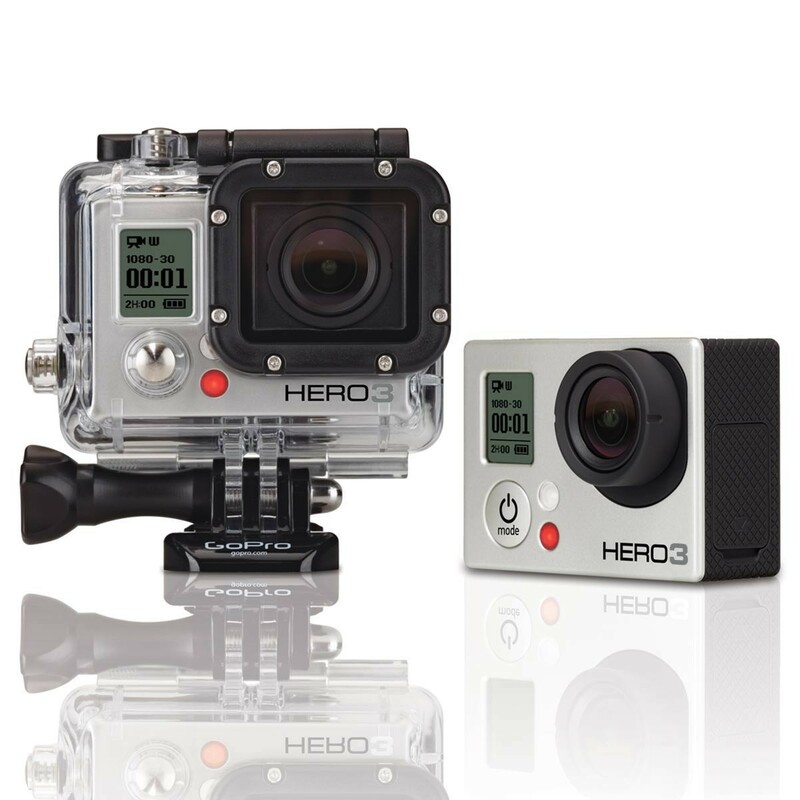 The HERO3+ is controlled by 3 buttons on the top, side, and front. The buttons are wider and easier to hit than previous models, giving you a bit more control even in the middle of an action shot. The shutter button at the top of the camera is what you'll use to take pictures and record videos. The front button access the camera's settings menu, which you navigate using the shutter button. The button on the side of the camera enables and disables Wi-Fi. If you're familiar with the HERO3's navigation system, you'll feel right at home here. The HERO3+ Silver manages to pack a wide array of resolutions and frame rates. It can record WVGA, 720p, 960p, and 1080p video with frame rates from 60 to 120 frames per second (fps). The HERO3+ also comes with advanced settings for recording video: Spot Meter automatically adjusts the brightness of videos when the camera is filming a bright location from a dark location, such as the inside of a car. Looping Video records a continuous video feed until you press the shutter button, preventing the camera from using up storage while you're waiting for an event to occur. And One Button mode, probably one of the more useful features, will power on the camera and immediately start recording video or time lapse photos. The HERO3+ is also capable of taking 10 megapixel (MP) photos at a maximum resolution of 3680x2760. The camera supports a burst mode of up to 10 photos/second, as well as time lapse photos from ½ second to 60 second intervals. The camera uses an ultra wide field of view (FOV), but supports medium and narrow FOVs at 720p and 1080p. The HERO3+ Silver packs a lot of features into a small form factor. At only 2.6 ounces (4.8 with housing) you'll barely notice that the camera's even there. The HERO3+ captures 1080p video at a silky smooth 60fps, though it does allow you to set lower frame rates. The HERO3+ features a slightly larger battery than the HERO3, promising an increase of 30% over previous models. You can expect a maximum battery life of 3 hours when filming 1080p video at 30fps. The HERO3+ carries over the Wi-Fi chip from its earlier models, allowing you to easily pair your camera with the GoPro App or a remote. In addition to letting you change settings from your phone or tablet, the GoPro App lets you preview photos, control playback, share via email and Facebook, and even stream live video. The HERO3+ Silver Edition comes with the standard fare: waterproof housing up to 40m, two adhesive mounts, two quick release buckles, a 3-way pivoting arm, and a USB cable for the rechargeable battery. GoPro also sells spare batteries, storage, an LCD screen accessory for adding touch to the HERO3+, and an extended battery pack for extra battery life. GoPro's introduced some great new features with the HERO3+. The smaller form factor, improved low light performance, and improved battery life make these cameras strong contenders in the premium action camera market. While these features may not be enough to attract users of the HERO3, the HERO3+ is fantastic for anyone who's new to GoPro or upgrading from an older series.